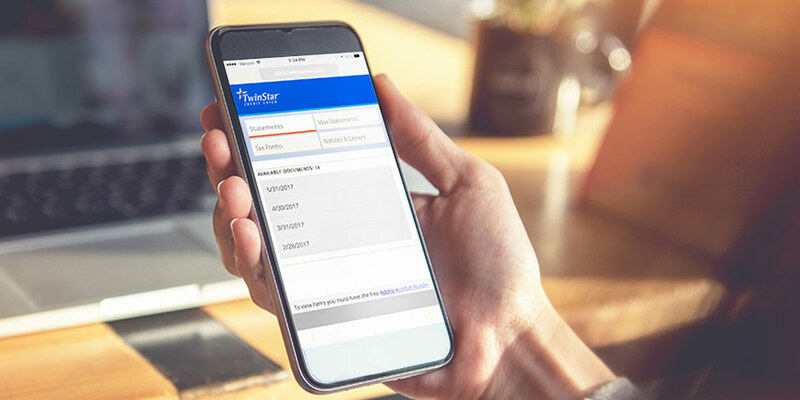 TwinStar has launched a new eDocuments server that will provide much faster and easier review and printing of account statements, letters and account notices. Every TwinStar member has access to eDocuments, but members with Kasasa Checking accounts must be opted in to paperless to qualify for the higher dividend rate. Look for the eDocuments tab in the left side menu the next time you log into online banking from your phone or computer. Please note that eDocuments will be available for the last 24 months. Older records may be available upon request. If you already receive eStatements, there is no action required, please enjoy the new faster, easier eDocuments platform! If you’ve had enough of paper statements piling up in your home office, get rid of them. Files are now saved in the popular PDF format that makes printing a breeze. Not only are they easier to find in online banking, but they will be organized too! Simply click the eDocuments tab, then click Paperless Opt In/Out. Verify you can access a PDF file, then select "eDocuments" as your delivery preference and you’re done. Now you can free up a bit of space at home and easily retrieve account information when you need it.